I have the ISO on a USB drive just now. You are going to have to guide me through the other steps you detailed regarding Rufus, The Wizard & other rescue type stuff you mentioned......."Eu não entendo o que você quer dizer". Hope that came out correct! 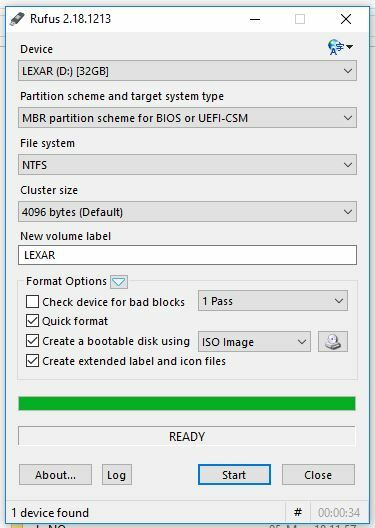 The following tutorial http://www.techfleec...ve-using-rufus/show how to create the bootable flash drive from the rescue.iso. In the end you will have several files and folders on the flash drive instead of only one iso file. Rufus will delete everything from the flash drive. After being busy with the relative in hospital I am taking the time today to look at this laptop issue & I confess I am a little unsure as to what we are trying to do here. It seems the laptop has a problem activating to certain functions like volume control, WiFi, etc. 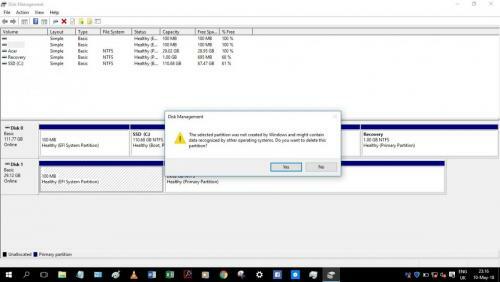 - If I make the deletions to the old almost empty eMMC flash drive will this help to fix this problem? - Once I have done the deletions should I then reformat the old eMMC drive? - Why am I making this bootable flash drive? Are we planning to use it to 'fix' the machine? - Copied original ISO file I created from Acer eMMC (from before the cloning) over to another USB stick, disconnected it & put aside....just in case. - Connected a USB with the ISO file on it to the machine & a clean USB to create the Boot files on. 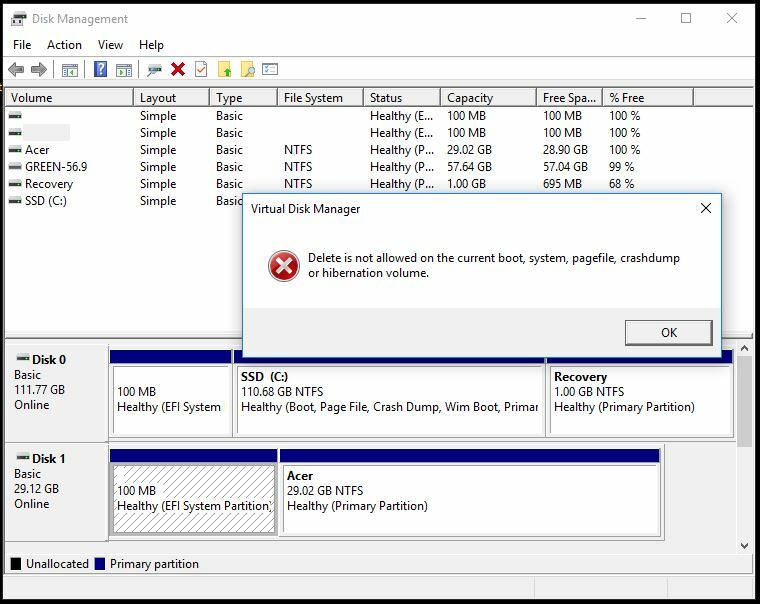 I then went back to the laptop & in Disk Management (deletion is not an option for the EFI partition in Partition Manager) tried to delete the EFI partition....result is below. 31257599 KB total disk space. 462292 KB in 187 files. 36 KB in 118 indexes. 44539 KB in use by the system. 42656 KB occupied by the log file. 30750732 KB available on disk. 7814399 total allocation units on disk. 7687683 allocation units available on disk. Waiting for your feedback before I go any further! Then only gave options to boot from the SSD or the eMMC so I chose the SSD. 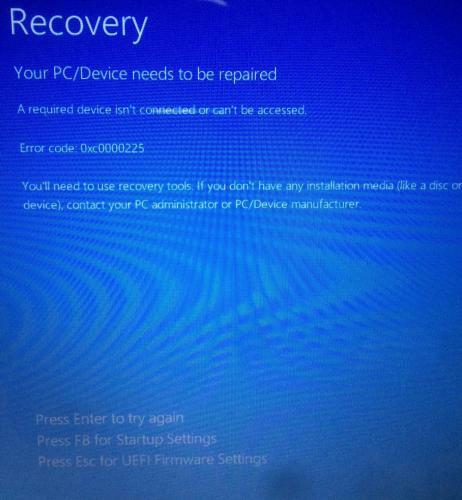 ** When I tried a different USB port I got the same result & then feeling stupid I told it to boot from the eMMC.....& it still booted from the SSD! I also tried to alter the boot up order in BIOS but the it didn't show the specific USB device, only 'USB FDD', 'USB HDD' so I tried that.......as first after Windows Boot Manager (WBM)....even tried to put them ahead of WBM but no change. I also tried to create a Boot file on to the old eMMC drive but although it shows up in Disk Management & Device Manager it didn't appear in Explorer or Rufus so no option there. Then hit Escape & went in to a limited UEFI BIOS page where I could only select from SSD or eMMC......either of which just kept bringing me back to the BSOD!! 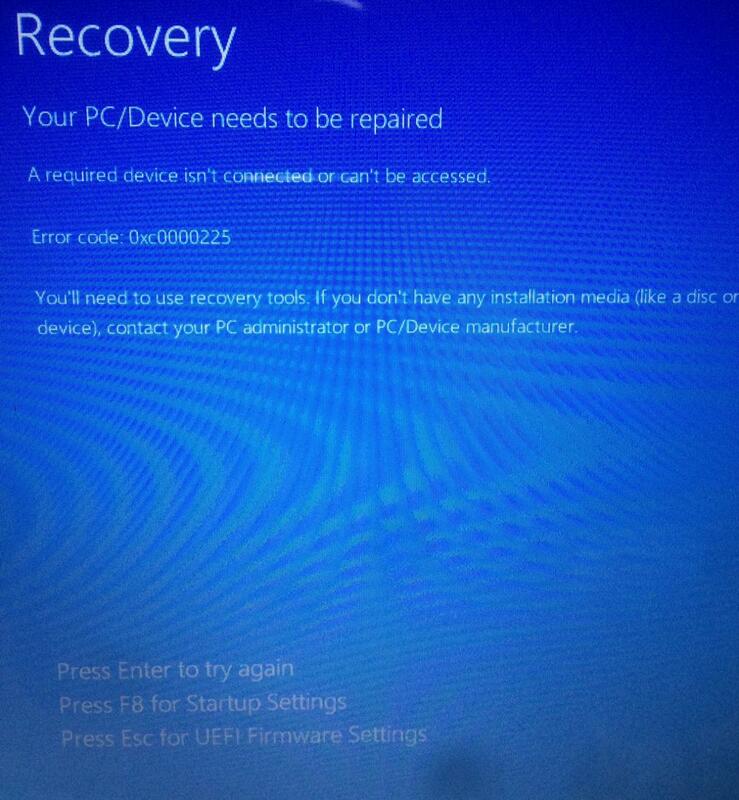 So spent more than a few hours online on 2nd machine to see what I could do but it seems that without any working recovery USB (machine has no DVD reader except a portable USB-connected one....& I have no recovery disk) I would maybe need to buy Windows 10 again. Put the USB recovery drive in to the machine & booted up....I hit F2 & went to the BIOS page & I found the USB drive is named & available.......Wow! I selected the USB as 1st Boot priority ahead of the Windows Boot Manager & hit 'Go!'. 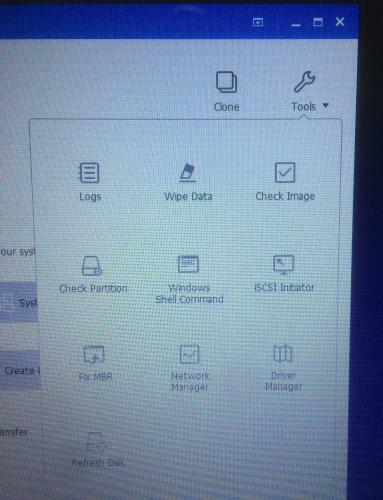 The machine boots up in to the EasUS Todo Backup programme! If I exited the programme it keeps cycling back to the EaseUS programme so I did a hard reboot & got back in to the BIOS page. I selected WBM 1st & USB 2nd. Machine reboots back to Blue Screen again........I hit Escape, we are back in to the BIOS Boot Priority selection again.......Hmmmmm!! It seems Rufus didn't select the UEFI option on the first try, that was the reason the BIOS didn't show the flash drive as boot option. 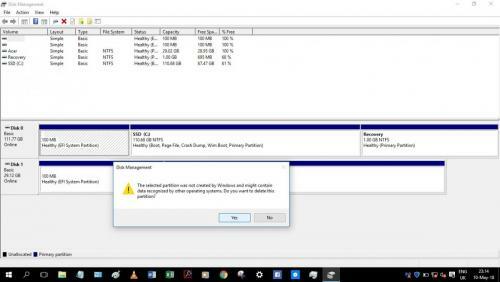 To boot from a flash drive you don't need to change anything on the windows boot manager configuration, the only change is on the BIOS boot order or press the F12 key several times immediately after power on the machine to access the boot menu and select the boot device. I suppose that now you can't boot the system from the SSD? Change the boot order on the BIOS to start from the SSD, use F12 during boot and start the machine using the macrium refect rescue. Inside Macrium Reflect there is one option Fix Windows boot problems try that to see if repairs the boot and the machine successfully start from the SSD. The good news is that I just managed to get back in to the SSD!!! So now we are back where we started!! I have reset the Boot Order to be WBM 1st, SSD 2nd & it now recognises the USB correctly. 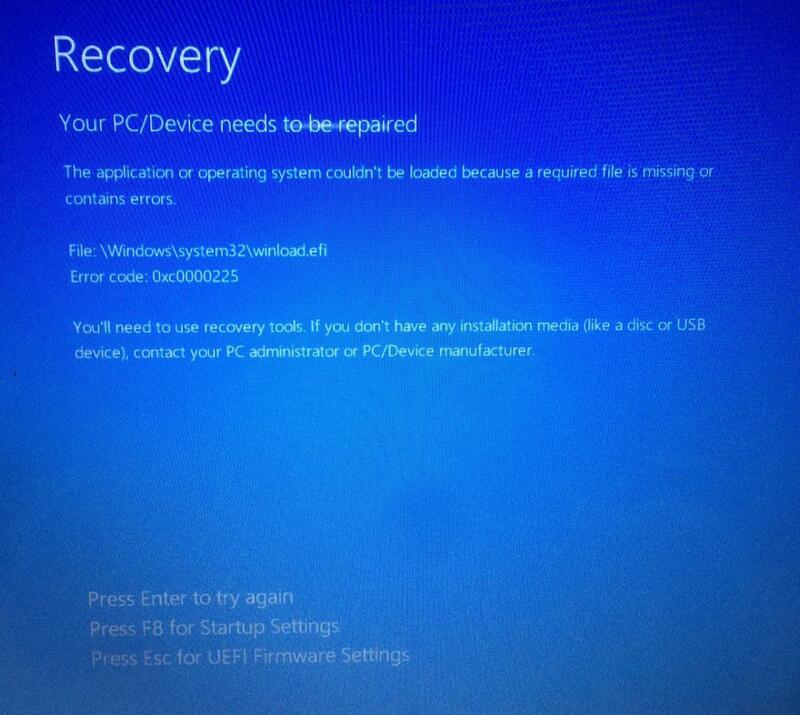 Should I now continue to reboot the machine from the Rufus Boot USB after changing the BIOS setting to do that? I have a feeling though that it will just boot up in to the ToDo Backup programme again! From where is coming from the ToDo Backup option? Using F12 should be possible to access the boot menu and from there the option to boot from the flash drive. The flash drive should be connected before restarting the machine. ToDo Backup was the programme I used to create the original ISO file before I did the cloning. Please see my post 24APR18, 10:07 AM. I then used ToDo Backup to do the cloning so it seems like ToDo is trying to restore my ISO file but the format it looks for is a 'pbd' file. I cannot find such a file on the Flash Drive! Apparently a 'pbd' file is created by EasUS Todo Backup....so it seems the ISO file I created is perhaps not 100% correct. The machine was running fine until I tried to delete the partitions & format the old eMMC Flash drive....it seems that the machine was still trying to run certain functions from the eMMC drive.....? Now I understand, so it seems the flash drive contains a rescue boot created by the ToDo Backup and not yet by Macrium Reflect. Removing any unneeded partition is important to avoid further confusion in the future. I don't think any changes on those System/recovery partitions used by the system affects the functions you describe, the problem must be something else. 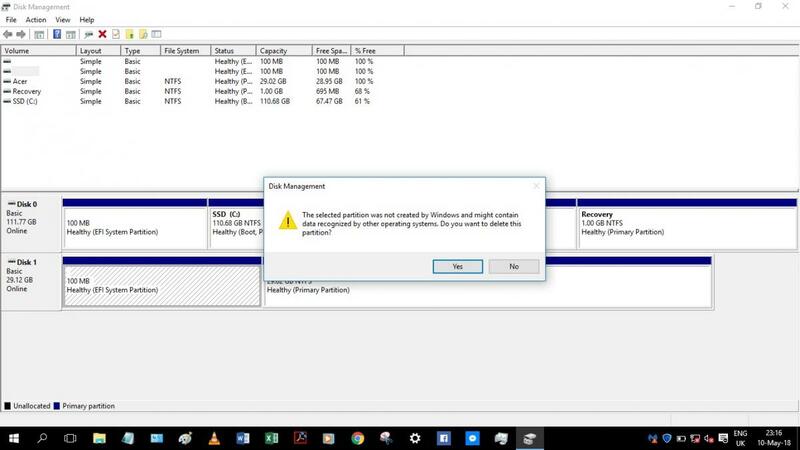 If you try to remove the "100MB Healthy EFI System Partition" on the SSD you get the same warning and confirmation prompts? 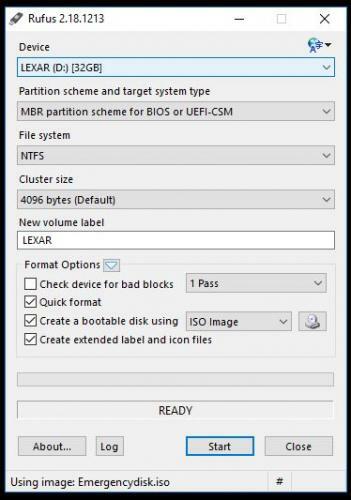 I have not tried to remove any partitions on the new installed SSD....only on the old eMMC original flash drive, & the results you can see on my earlier posts. Just tell me the steps & I will work through them. Try to delete the 100MB partition on the SSD, if the system is using it, it will not let you do that. If the partition got deleted it can be copied again from the eMMC or the backup. Just tried that now & below is the warning message I got....I did not delete the EFI partition yet. 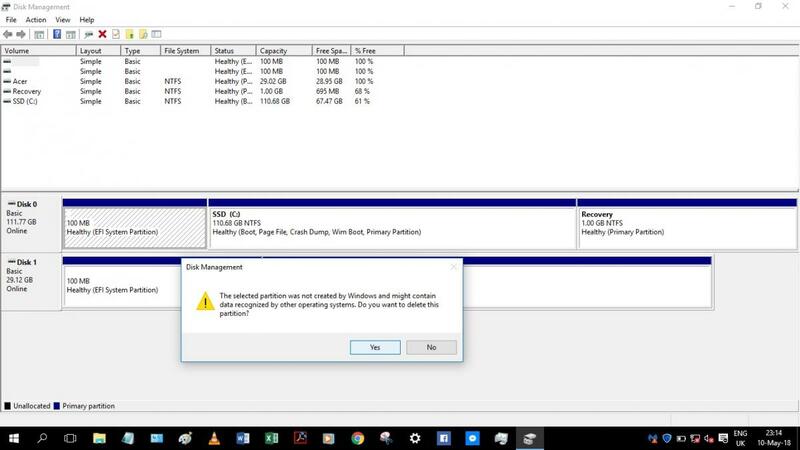 From curiosity I also looked at the message I would get if I tried to delete the EFI partition from the old eMMC drive.....the same message. - I did not see any option to copy the EFI partition. How would I do that? You have a backup created using Macrium Reflect right? Do you have another smaller flash drive with size 4/8 GB? I haven't made the backup with Macrium Reflect yet.....just need some time to go through the website tutorial to see how. Indeed I'll look for smaller flash drives! As the bad Acer laptop has no web access other than LAN cable, & my mobile broadband is WiFi only (no cable output) I had to consider to download everything I need on my good laptop, then install it on the Acer via USB drive. Tutorial (Fig 2) advises that after downloading the initial application I would have an option to not 'Run Installer directly after downloading', so I download everything to a USB ready to copy over. 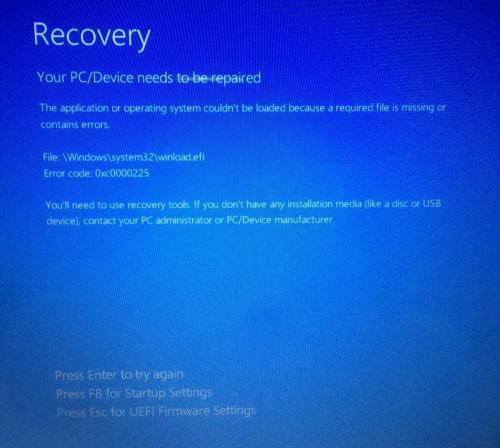 I do not think I will be making a Rescue Media from one laptop to be used on another different one....is that correct? If so then when I run Macrium to create a Rescue Media, will this be from the damaged Acer, or will it do it from the WinPE files that were downloaded from Macrium...?